On the far eastern side of Jefferson County lies the peaceful city of Sullivan. 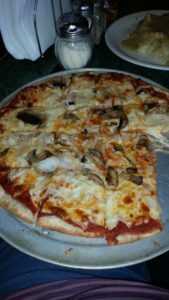 If you find your way there you owe it to yourself to visit Pour Man’s Pub and Grill, where you will find great home made pizza for a really reasonable price. Your Jefferson County Pizza Review Crew made the run to Sullivan on a recent Sunday afternoon. It all begins and ends with the crust and Pour Man’s has a good one. This crust has a crunch that only ground corn can provide. Super scrumptious. The toppings on our pizzas were plentiful. No need to order double cheese or double anything for that matter. Pour Man’s pours it on with plenty to satisfy. Order a beer and it comes in a cold 16 ounce glass. Yummy! This place is a pub, not a fancy schmancy establishment. Famous for their broasted chicken, we had to have a sample and were not disappointed. Real mashed potatoes and gravy on the side made the chicken just heavenly. Try Pour Man’s. Neat and clean as a whistle, and Wisconsin friendly, this joint is right up the old pizza alley in beautiful downtown Sullivan. Your Jefferson County Pizza (and Broasted Chicken) Review Crew!